Our I-CAR® Gold Glass and Assured Performance certified technicians provide expert factory color paint match to return your vehicle to pre-accident condition. Today’s modern factory finishes incorporate multiple layers of highly specialized paints. Brown’s Collision and Brown’s Collision & Coachworks has made a major investment in the PPG paint system and constantly upgrades its technology and equipment to ensure that each vehicle’s finish matches using environmentally safe paints. Our state-of-the-art repair facility is equipped with Rohner down draft paint booths to provide a superior spray environment for a variety of custom, factory color matched paint and finishing needs. 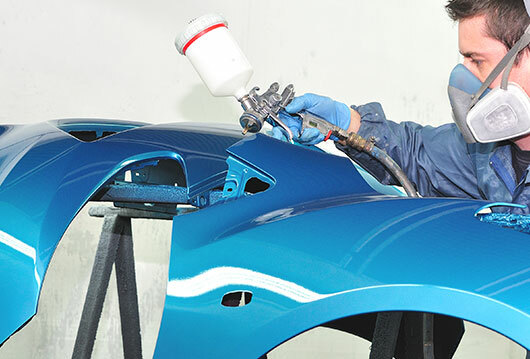 Our optimal spray coverage environment, PPG paint system and certified technicians will ensure your vehicle’s results are smooth and refined.